Research says that giant, rotating black holes would give interstellar travelers a smooth ride. 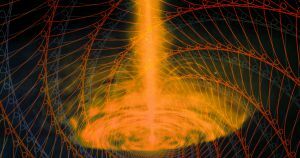 For years, scientists have theorized that black holes could serve as portals for interdimensional travel. But there’s always been a problem: how could a hyperspace traveler ever approach a black hole without getting torn to teeny-tiny shreds by the black hole’s unholy gravitational forces? It turns out that some black holes are gentler than others, according to University of Massachusetts Dartmouth physicists. If a black hole is large enough and rotating quickly enough, astronauts would have a nice, smooth ride the whole way down, according to research published in the journal Physical Review D.
Computer simulations show that the singularity inside a giant, rapidly-spinning black hole is far weaker than in other black holes — to the point it may not even crush a wayward spaceship. In fact, its passengers may not even notice the force exerted by the black hole, long thought to obliterate anything that comes near, at all. In his essay, Khanna likened the hypothetical experiences to moving your hand through a candle’s flame. Sure, the fire is hot enough to melt your skin away if you leave it there too long, but you’ll only feel a fleeting warmth if you whisk it through quickly enough. The jury is still out on whether hyperspace travel exists. But if anyone ever wanted to give it a shot, now they know where to aim.